Unworkable. An Indigenous veto. An invitation to legislative gridlock. When speaking of Indigenous rights in this country—usually of implementing the United Nations Declaration on the Rights of Indigenous Peoples—most commentators fail to focus on what those rights are and why they matter. They neglect the tie of Indigenous rights to human rights, and the potential of the former to benefit our constitutional democracy. Where our own pundits have not served us well on this point, we must venture further afield. Recent events and an old debate in Argentina bring the connection of Indigenous rights and human rights into sharp relief. First, the events. On August 1, 2017, Argentine security forces evicted a group of Mapuche Indians from a plot of private land in Patagonia. The group had occupied the land, which it claimed as Mapuche ancestral territory, since 2015. According to witnesses, border police loaded one protester into a white truck. Santiago Maldonado has not been seen since. 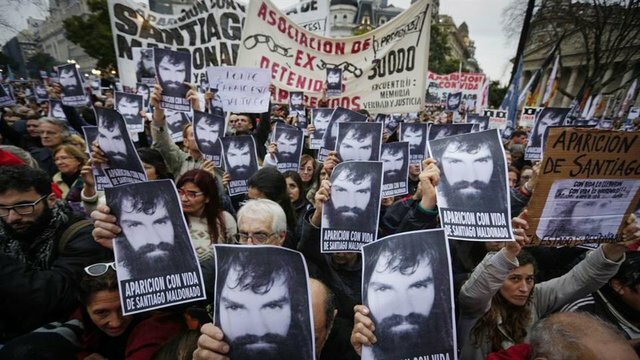 “Dónde está Santiago Maldonado?” Where is Santiago Maldonado? Throughout August, the question became the social media rallying cry for protests in Buenos Aires. The national government had badly mishandled the investigation, at one point even blaming the protester for his disappearance. The case and its handling conjured memories of the “disappearances” of tens of thousands of Argentines during the country’s dictatorship in the 1970s. On September 1, tens of thousands marched before the President’s Palace. Again, they asked, where is Santiago Maldonado? Though the protest was peaceful, a few threw stones. Police reacted with rubber bullets, arresting 30 and wounding 23 people. Indigenous rights bleed into human rights. In 2017, Amnesty International reports, violent evictions of Indigenous groups continue throughout Argentina despite legal and constitutional guarantees against it. Santiago Maldonado is still missing. Those arrested on September 1 were released, but Argentines are left to question their national government’s commitment to a still-fragile rights culture. Now for the old debate. In 1982, noted Argentine writer and cultural critic David Viñas wrote an essay, “The Foundations of the National State.” From his political exile, Viñas probed the Argentine army’s final push into Patagonia over 100 years before. What, he asked, actually happened in the “conquest of the desert” of 1879? Official Argentine history marks the campaign as decisive, acquiring vast swaths of land for cattle ranching and finally subjugating the Indians. Viñas noted the peculiar silence of historians on the campaign’s details. How many Indians actually were killed in it? Might the Indians have been the “disappeared” of 1879? Which brings us to the crux of the matter. Indigenous rights and human rights are tied. Though the former are collective and the latter individual, the difference is not decisive. Both insist that people—or peoples—have the right to develop freely and that states cannot eliminate them, cannot even unduly disrupt them, in the name of a purported national interest. But is this limit not good for constitutional democracy? States, as we recall from Max Weber, are entities whose monopoly on the means of violence is otherwise absolute. The contexts are different, true. Happily, the Canadian state never did take to disappearing its political opponents. Yet these few examples from Argentina still can lend fresh perspective to an old debate. Think of the starvation policy during the breakneck settlement of the Canadian Prairie, or of the generations lost to residential schools. Now think of the chronic underfunding of First Nations child welfare, or the gender discrimination still lingering in the status rules of the Indian Act. These are state-led human rights violations. Could they continue if the UNDRIP were implemented? On the tenth anniversary of the Declaration's adoption, the question is worth asking. So let’s stop dismissing Indigenous rights on the grounds that they disrupt business as usual. Let’s start discussing them as collective human rights. The effort promises to improve the quality of our dialogue in this country. ​It may even improve our democracy.